WindowSecureScanner is another advertising-supported application based on Crossrider engine. 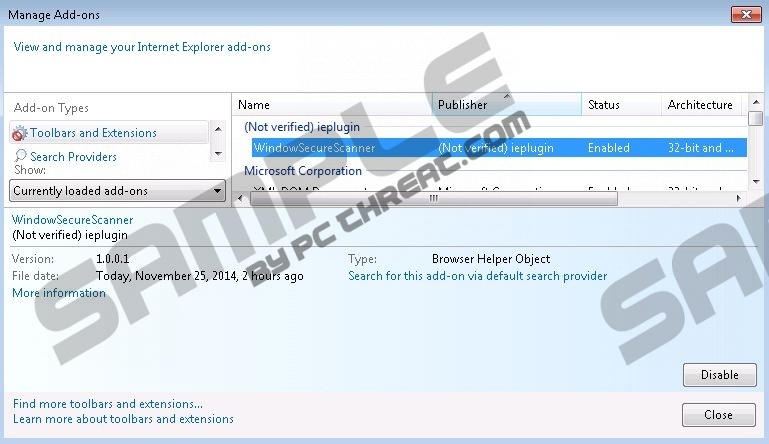 The program is very similar as previously published applications; thus, if you have ever heard about Crossrider-based programs or detected any of them on your system, you will definitely know how WindowSecureScanner is going to act. If you know nothing about these programs, you should know that they will provide you with various commercial advertisements. WindowSecureScanner is not an exception; this program will bombard your Internet Explorer, Google Chrome, and Mozilla Firefox browsers with commercial advertisements. We suggest that you stop them from appearing as soon as possible. In order to do that, you will have to remove WindowSecureScanner. You will definitely not miss it because this application is completely useless. Advertisements are not harmful themselves; however, it is impossible to tell whether completely reliable links are embedded into them, which is why we recommend that you do not click on them. Keep in mind that WindowSecureScanner collects information about your online activities; thus, these ads might seem decent and even interesting. Actually, many adware programs use the same strategy in order to lure you into clicking on them; thus, you should be very careful. Keep in mind that you might end up with many unreliable programs after clicking on ads; thus, it is better to ignore them all. Adware programs are very sneaky and they usually slither onto the computer without user’s permission. Even though it might seem difficult to prevent them from entering the system, the truth is that you will be able to do that very easily. You just have to install a trustworthy antimalware tool on your system and infections will not be able to slither onto your computer again. In order to block the way for malware, you should also make sure that you do not download unreliable programs or click on ads that appear on torrent, file-sharing, and similar websites. It seems that you will be able to delete WindowSecureScanner manually; however, if you cannot get rid of it using our manual removal instructions for any reasons, you should definitely try to get rid of it automatically. You will have to acquire an automatic tool first and then launch the scanner. In order to help you remove this adware easily and quickly, we recommend using SpyHunter malware remover. It will erase ALL the existing infections and protect your PC in the future. Quick & tested solution for WindowSecureScanner removal.